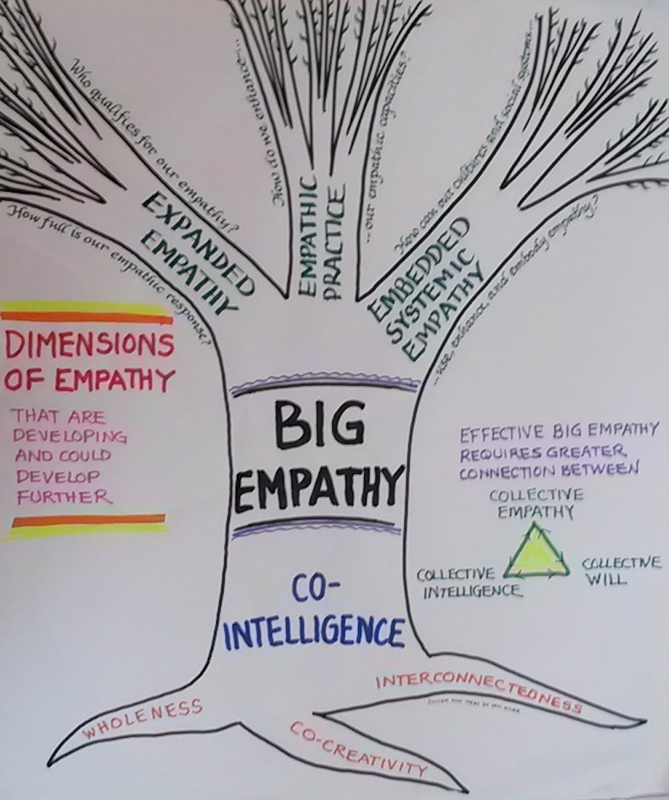 In the last ten days two major compilations have been posted related to the co-intelligence work – one on Big Empathy and one summarizing the work of the Dialogue and Deliberation Transformation initiative in January (“D&DTrans”). Here are overviews and links to both. I have been studying empathy pretty intensively for about a year, inspired largely by the Credere “Empathic Individualism” Award I received last year. 3. embedding empathy in our cultures and social systems. You can review an extensive brainstorm of ways these three developmental realms can be nurtured. 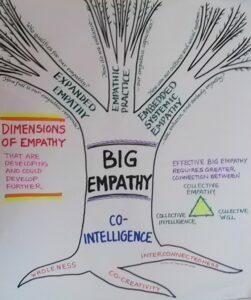 I invite you to explore summaries and links of all these new materials and my various empathy blog posts on a newly dedicated Empathy page on the Co-Intelligence Institute website. our business-as-usual habits and systems? Many NCDDers offered a rich flood of diverse responses. Several of them – notably Bohm Dialogue pioneer Linda Ellinor and online conversation maestro Ben Roberts – took initiative to organize actual conversations around my question. I joined them as a thinking partner in a dozen organizing calls and countless emails. Their efforts drew more than 60 people into almost 40 hours of conversations exploring the role of dialogue and deliberation in addressing extinction level issues like climate change. This massive undertaking included 3 virtual World Cafes, 2 virtual Open Space meetings, and 6 virtual Bohm Dialogues using audio (and sometimes video) phone conferencing platforms which enabled participants to talk in breakout groups as part of the larger virtual gatherings. Participants and organizers both took extensive notes on a wiki-like online platform called Hackpad and added further comments between conversations. You can explore a recently completed final report describing highlights of the whole process. It includes many links to the original Hackpad material. I reported to you the results of conversations I personally convened in the virtual Open Space about “Sixteen Approaches to the Strategic Use of Conversation”. But that report represents only my personal slice of a much larger collective whole that is worth exploring in the final report if you find the convening question (above) compelling. May all these rich resources be of interest and use to you. Blessings, always, on all our individual and collective journeys.